Pink Floyd news :: Brain Damage - Happy birthday, Roger Waters! The combined wishes of all of us on the Brain Damage team, along no doubt with many of you reading this, go to Roger Waters, who celebrates his 75th birthday today. Roger was born in Great Bookham, Surrey, in 1943, moving to Cambridge when he was two years old. It was there that he met, and became childhood friends with, a number of key people in the story of Pink Floyd. 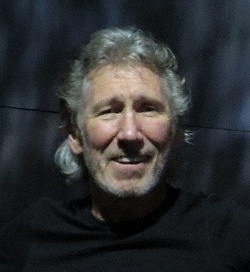 Of course, Roger has been extremely busy over the last few years, having successfully taken Dark Side Of The Moon on tour in 2006, through to 2008. On completing that, he immediately started work on a new version of The Wall - which finally opened in September 2010. That tour was spectacularly successful, wrapping up in Paris for show number 217 in September 2013. Recordings of that tour turned into the film, shown in cinemas and released on DVD/Blu-ray and as part of a mammoth, Super Deluxe Edition. We hope you have a great day, Roger. Many happy returns!